It is really Coelogyne time in the greenhouse this week and one wonderful species is Coelogyne swaniana with its long pendulous spikes of bright cream and brown flowers. 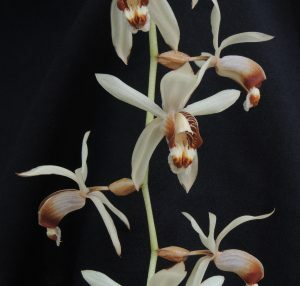 The species is similar to Coelogyne pulverula featured earlier in the month (Day 450 and still in flower) but has wider spaced flowers on slightly shorter spikes and shorter wider leaves. Coelogyne swaniana is one of the warm growing Coelogyne species. It is native to Malaysai, Borneo, Sumatra and the Philippines in evergreen forests at around 900m altitude where it grows in moss on shaded branches or steep banks. It grows well for us in Warm Asia in shade and watered well throughout the year. We find with Coelogynes of this type that the flowers bruise easily on suffer from water damage and so it is a good idea to move the flowering plants onto a high shelf where the flowers can be enjoyed and treated carefully to extend blooming.